1. Gently unpack your clock (a), locating the pendulum (b), weights (c) and headboard (d). Your clock may or may not have a headboard and it may have two or three weights, depending on the model. Be sure to save the original box and packing material for future use. 2. Place the clock face down. Open the back of the clock by turning the small metal latch (2a). Remove the back panel and pull the paper out from behind the spiral gong wire on the inside of the back panel (2b). 3. Gently slide out the two bellow clips (3a, 3b) at the upper inside of the clock and save them with the original packing material. Replace the back panel. 4. Turn the clock onto its backside. Push aside the wire lever (4) to unlatch the cuckoo's door, allowing the door to swing freely. The wire latch should remain affixed to the clock body. 5. At the bottom of the case, you will see a paper packet which secures the clock's chains. Loosen and remove the paper packet, allowing the ends of the chains with the round brass washers to extend fully. If there are knots in the chains, untangle them gently. Once the chains are untangled, keep the clock in an upright position to avoid their sliding inside the clock and off the sprocket wheels. 6. For maximum running time, hang your clock approximately 6' off the floor on a secure, strong nail or hook. At this height, the round chain ends should hang about 6" off the floor. Running time will be a full day or week depending on the clock mechanism. If there is no stud behind the wall where the nail is to be driven, use a wallboard anchor (molybolt) or heavy duty fastener of the correct type for your wall. Picture hooks will not provide the necessary level of safety. Make sure the clock hangs flush on the wall and does not lean forward. 7. Attach the pendulum to the "U" shaped wire pendulum leader at the bottom of the clock (7a). Then attach the weights to the hook ends of the chains (7b). 8. Now mount the headboard if there is one. Silent Lever. 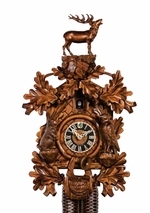 Most Cuckoo Clocks have a "silent" lever on the side or bottom of the case. Place the lever in the "on" position if you want your clock to "cuckoo" and play music (on models so equipped). In the "silent" or "off" position, both cuckoo and music are silenced. Avoid placing the lever on "silent" as the cuckoo is sounding; you may, however, move the lever to "on" at any time. Start the clock and place it "in beat." Gently swing the pendulum to one side to start its momentum and initiate the clock's ticking. Listen carefully - if the ticking lacks a perfect or regular rhythm, your clock will run for only a few minutes and then stop. Swing the base of the clock a little to the left or right until the ticking is even. Many owners place a faint pencil mark on the wall along one side of the clock. This can be used to reposition the clock if it is accidentally moved. Set the time by moving the long hand (minute hand) clockwise or counter-clockwise. If the short hand (hour hand) is accidentally moved out of place, the hour indicated by the hour hand will disagree with the cuckoo count. You can gently hold the hour hand near the shaft and turn it clockwise or counter-clockwise so that it correctly indicates the number of hours counted by the cuckoo. Then, using both thumbs, push the hand down on the shaft (back towards the dial) to tighten. In the event that your clock stops running and the minute hand won't move forward, turn the minute hand counter-clockwise one hour, then slowly advance it clockwise or counter-clockwise to the correct time and repeat No. 2 above. 4. Winding the clock. To wind your clock, firmly pull the free ends (ring ends) of the chains to raise the weights to the base of the clock. To avoid the chains coming off the sprockets inside the clock, always keep the weights on the chains. Avoid roughness in winding and never pull on the weights themselves as this may damage the chains or ratchet mechanism. It is impossible to overwind your cuckoo, however you may damage the chains if you continue to pull on them once the weights have reached the base of the clock. 5. Regulating your clock. You can adjust your clock to run faster or slower. To make your clock run faster, unhook the pendulum and slide the pendulum carving up a bit on the pendulum stick; to make the clock run slower, pull the carving down a bit. Reattach the pendulum to the pendulum leader at the base of the clock. 6. Set your clock using an accurate time source after each pendulum adjustment. Once your clock is accurately regulated, you can mark the back side of the pendulum stick with a pencil indicating the position of the carving on the stick. If the carving is accidentally moved, you can easily replace it to its correct position.